Leading the way with green buildings and innovative social enterprise programs, regional South Australia is home to some exciting community learning centres and recently Quest was lucky enough to visit four of them in a day as part of Community Centres SA’s conference held in May. In an impressive feat of logistics, conference organisers coached 50 participants, (complete with luggage) to four different regional towns covering over 150 kilometres. The day kicked off at the spectacular Woodcroft Community Centre and library (also housing Onkaparinga city council), an eight million dollar state-of-the-art sustainable building design that left us all inspired by its green features. Highlights included an air conditioning system that senses when there are a large number of people in the room (by raised carbon dioxide levels) and automatically increases the amount of oxygen being introduced into the air. Good news for sleepy students. Other highlights included a beautiful crèche where children could play while parents did classes and the stunning library—a wonderland of creatively designed reading nooks, natural sunlight, cushioned areas and bright decoration. It was inspiring to see so much care and expense poured into a facility for all the community to use. The Yankalilla Youth and Community Centre is quite literally the town’s crowning glory, perched up on a hill that overlooks the whole township and it’s creation is a testament to the power of partnerships. Just three years old, the centre would not have been built if it weren’t for the efforts of local Lyons Club member, Jim Martin, who deeply believed that the community needed something for its young people. He recruited fellow Lyons club board member, Bill Leckie, and together they approached the executives of Star Fish Hill, a local power company, and asked them for a contribution to build a centre. Star Fish offered $40,000 but they wanted it to be for the whole community (not just young people) and they wanted to work in partnership with other funding bodies, so Bill and Jim approached the council and they matched the same amount. They then applied for state and federal funding and lastly went to the most important stakeholders of all—the community—to ask for contributions. Gold and silver levels of membership were created to reflect the amounts that community organisations gave. It ranged from $10 to $6,000, which was given by an individual family specifically for a kitchen (there is now a plaque above the stove.) 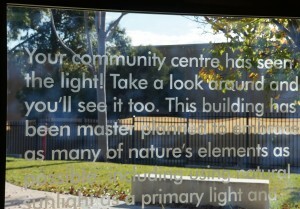 Finally they had $240,000 to spend on their building and an architect (Bill’s son) to do their design. The building is an impressive, yet welcoming ochre-coloured rammed earth with The Centre written in giant silver letters across the entire front wall. Inside it is spacious and light-filled. “What you have here is a community effort,” says Jim Martin. The Lyons club took on the kitchen and Jim did much of the construction and fit out himself. The centre houses service providers in disabilities, jobs, and psychology with a local caseload who used to have to travel almost hour a way for appointments with no public transport. As a squally wind starts whipping up the sunny day we rush back onto the coach headed for Victor Harbour, where we’re about to encounter some extraordinary social enterprise projects for people with special needs. 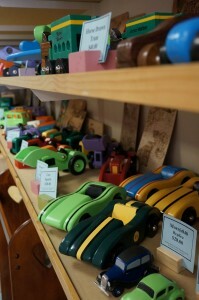 The first thing you see when you walk in the front door of the Encounter Centre, Victor Harbor, are shelves of delightful hand-painted wooden toys that have been made by the participants who come here. Down the hall, the commercial kitchen is buzzing and conference delegates are served a delicious shepherds pie and steamed vegies, prepared once again by a team of community volunteers and learners. Originally established in 1974 as a support service for the intellectually and physically challenged, it has now expanded to provide participants the opportunity to develop skills and enjoy social interaction with a wide cross section of community members. The centre boasts a vibrant array of learning spaces, including the carpentry workshop where toys and cabinetry are produced, a nursery, community garden, kitchen and literacy classrooms. A full time workshop coordinator makes sure everyone uses the wood-working equipment safely and on Fridays it is hired by the local men’s shed group. The classes go for the whole day, with formal learning in the morning and informal activities, like computer literacy programs, games, puzzles and free reading in the afternoon. Leonie has been teaching here for almost seven years and many of her students have been with her for all of that time. A limited amount of funding covers a portion of the few employees, and the rest of the costs are met by the sale of the toys and plants from the nursery. They even have a customised trailer to take their toys to markets and events. Click here for the Encounter Centre’s website. Another winding drive along the expansive South Australian coastline through spitting rain leads us to the day’s last stop and conference venue for the next two days—historic Milang. Full of tumbling stone buildings lining a wide grey sea, Milang is piece of South Australia’s history as well as the mouth of the mighty Murray River. The remainder of the conference will be held at the Milang Old School House Community Centre, and Quest catches up with coordinator Karyn Bradford before the crowds arrive for dinner. Behind the old schoolhouse is a large shed that looks more like a marine research facility than a community learning space. Karyn explains how increasing river salinity has meant that saltwater tubeworms have been able to move into the river and infest the shells of freshwater turtles. The worms bore thousands of tiny holes deep into the turtle’s shell. “They either drowned or came up onto the shore, but then they couldn’t retract their heads or their legs and so they were attacked by foxes and feral cats,” says Karyn. Four years ago, children from the local school began rescuing the turtles, bringing them back to the shed and soaking them in fresh water, which killed the tubeworm. They rescued over 3,000 turtles and released them back into the wild when the salinity levels dropped, except for a few pets kept for education purposes. The shed is now used as a teaching resource for other schools, environmental groups and for the Cert IV and Cert III level in Conservation and Land Management training that the centre runs. “We’re able to tell them about the local species that were really threatened,” says Karyn. “It’s not just turtles, there are Murray Cod, Bony Bream and other local native fish cruising around in the tanks. We Noah’s Arked some of the smaller native fish because there was such concern that they would be wiped out.” Many students come from the Nanggumiri sister community across the lake; “It’s been really fantastic to rebuild those relationships,” says Karyn. lFor what are libraries, if not for learning?